INDEX funds were devised in the 1970s as a way of giving investors cheap, diversified portfolios. But they have only become very popular in the past decade. Last year more money flowed into “passive” funds (those tracking a benchmark like the S&P 500) than into “active” funds that try to pick the best stocks. In any other industry, this would be universally welcomed as a sign that innovation was coming up with cheaper products to the benefit of ordinary citizens. But the rise of index funds has provoked some fierce criticism. Two stand out. One argues that passive investing is, in the phrase of analysts at Sanford C. Bernstein, “worse than Marxism”. A key role of the financial markets is to allocate capital to the most efficient companies. But index funds do not do this: they simply buy all the stocks that qualify for inclusion in a benchmark. Nor can index funds sell their stocks if they dislike the actions of the management. The long-term result will be bad for capitalism, opponents argue. 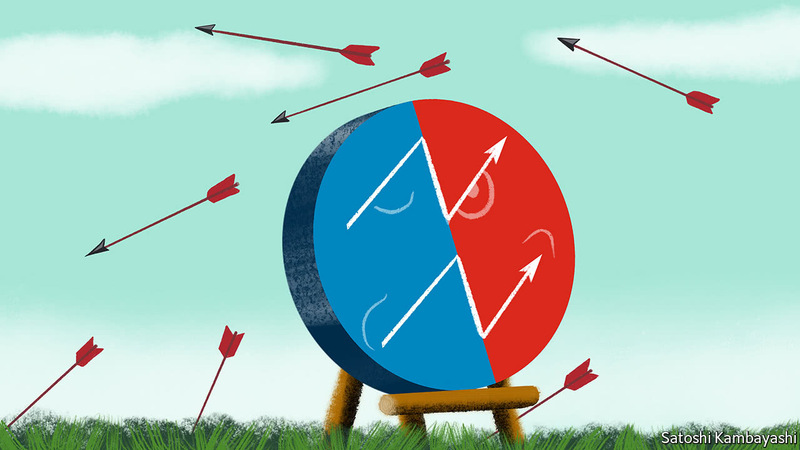 A second argument is that index funds pose a threat to competition. The asset-management industry used to be remarkably diverse. It was hard for any active manager to keep gaining market share; eventually, their performance took a hit. But passive managers benefit from economies of scale. The more funds they manage, the lower their fees can become, and the more attractive the product. Since passive managers like BlackRock and Vanguard own the shares of every company in an industry, the fear is that they might play a role reminiscent of the monopoly “trusts” of the late 19th century. Studies have argued that the concentrated ownership of shares is associated with higher fares in the airline industry and fees in the banking sector. These criticisms cannot surely both be true. They require index funds simultaneously to be uncritical sheep-like investors and ruthless top-hatted capitalists devoted to gouging consumers. Furthermore, passive investors, in the form of mutual funds and exchange-traded funds, own only 12.4% of the American equity market. It seems remarkable that they can have such a big impact on the corporate sector with such a small stake. It is worth examining the criticisms in detail. The Marxist criticism implicitly assumes that the investment community is divided into two—passive investors and active managers devoted to combating corporate excess and ferreting out exciting new bets. But a lot of “active” investors run portfolios that cling closely to a benchmark index for fear of getting fired if they underperform. So they, too, own shares in the biggest firms. A few “activist” investors do try to change corporate strategy but most fund managers don’t have the time to campaign. They may be active but they are not activist. When it comes to voting at annual general meetings, moreover, passive managers can and do get involved. In one 12-month period, BlackRock says it voted in support of proposals from activists 39% of the time, compared with 33% of occasions where it backed existing management. Even if you concede the potential for a small group of fund managers to exert baleful influence on a few sectors through their cross-holdings, passive managers are surely the least likely participants in such a conspiracy. The point of their existence is that they hold the market weight in every industry; they have no reason to favour the success of one over any other. If a conspiracy were to occur, it would surely be driven by active managers buying very large stakes in a particular industry, and hoping to benefit accordingly. There is an element of reductio ad absurdum about the anti-passive arguments. Yes, if the market was 100% owned by index funds, that would be a problem. And if there were no crime, policemen would be out of work. But we are nowhere near that point. Stop worrying and enjoy the low fees. - The first three parts to this series covered the mechanisms of Federal Reserve operations, the unintended consequences of too much debt and the resulting issues from the increase in bad debt. - Critics say that the US will not be able to repay its debt obligations and that hyperinflation will result in a collapse of the US dollar; this is likely inaccurate. - Currencies are valued on a relative basis and our major trading partners are far more indebted, meaning that their currency must depreciate before the dollar. - The only way all currencies can fall together (since they are relative) is to devalue against gold or some other hard asset commodity - an unlikely scenario. This is the final segment to this four part series on the Federal Reserve, 'money printing,' the unintended consequences of Federal Reserve policy such as debt accumulation, the impacts to the economy and finally the end game. The first part to this four-part series covered the mechanisms in which the Federal Reserve conducts open market operations and how the Fed has never actually printed money in its truest sense of the word but rather increased the monetary base through crediting reserve balances of primary dealers. Reserves are not considered money and are not part of M1 or M2 but rather are part of the Monetary Base. The Federal Reserve had hoped to increase inflation by having the banks loan out their newfound reserves, which would thereby strongly increase the growth in the money supply and cause inflation. This did not occur as the rate of bank lending never exceed the historical average and was lower than average in most cases, resulting in a growth of the money supply that was consistent with past decades. Because money supply growth was more or less constant and the velocity of money has been in decline, two factors that contribute to aggregate demand, the rate of inflation has been continuing to fall and has not exceeded the 2% Federal Reserve target with any degree of consistency, much to the surprise of popular market opinion. The second part to this series covered the unintended consequences of Quantitative Easing (QE) and zero interest rate policy (ZIRP) as well as the structural and secular issues of over-indebtedness, which have been exacerbated by these aforementioned polices. The overload of debt that has accumulated recklessly over the past few decades, compounded by misguided Federal Reserve policy, has brought the economy to a point where we have mortgaged all our future growth for current (past) consumption. The anemic rates of growth over the past decade are a result of a massive debt increase in the four critical non-financial sectors of the economy (Federal, State & Local, Corporate, Household). Total economic debt for the United States (public and private) has surpassed $70 trillion and now stands over 370% of Gross Domestic Product [GDP]. Part II of this series outlines the debt problem across all the economic sectors in more detail as well as how the increase in debt will mathematically guarantee lower rates of growth in the future without some positive shock to the economy. You can find the article by clicking here. The penultimate part to this series on the Federal Reserve detailed the consequences and symptoms of an over-indebted economy. Increases in debt raise the cost to service that debt, which lowers the saving rate, lowers the velocity of money, lowers long-term interest rates and causes companies to forego growth-generating projects in exchange for financial engineering. These dynamics further decrease the productivity of the labor market, which cause a secular decline in wage growth, amplifying the problem and making it more difficult to pay down debt. 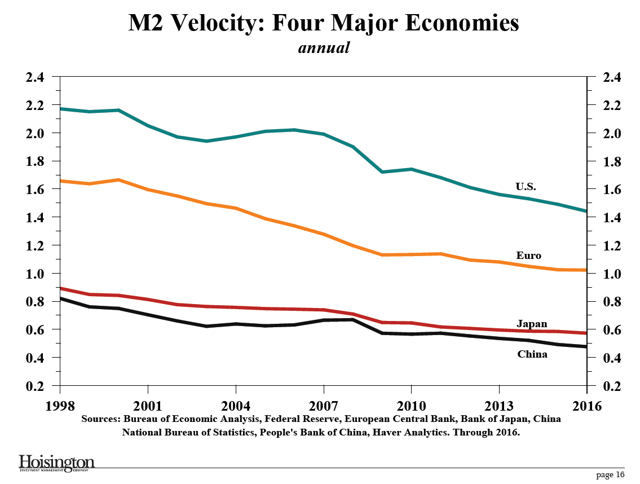 The Federal Reserve, through ever-tightening monetary policy, is taking steps to further decrease the growth in the money supply (M2), which multiplied with falling velocity, will stand to reduce the growth rate of the economy at an accelerating pace. This final part will cover why the end game to this problem of over-indebtedness will not end in hyperinflation as many suggest but more likely will end with one of crushing deflation, similar to the results of the 1930s and 2008, two massive economic issues brought about by a systemic issue of over-indebtedness. As I stated in part III, my current forecast is that the Federal Reserve is going to reverse the course of monetary policy before the end of 2018 due to severe disinflation and anemic or even recessionary levels of growth brought on by excessive debt, and that the equity market (SPY) will experience a much choppier ride due to these factors. The Federal Reserve is likely to cut interest rates by the end of 2018 due to falling long-term rates (TLT) that will cause a very flat or inverted yield curve (IEF), hurting the banking sector (XLF) and changing investor sentiment to one of more caution and fear of a pending economic slowdown. Before moving on to the end game, and ultimately how we may choose to exit such a problem that we have created, it is important to take a look at past instances of over-indebtedness, the issues that led to such levels of debt, the consequences of that debt build-up and finally, the end game or the solution to the problem. While these occurrences of debt-induced crashes happen at irregular intervals, which is one of the challenges in forecasting the next panic year, the build-up of debt, the actions during the build-up phase and the end game/solution have all followed similar paths. We currently sit in the fifth major occurrence of debt accumulation in the United States since the 1800s and the current build-up of obligations dwarfs the past four debt peaks which led to panics and crashes that had lasting consequences. It comes as no surprise that the level of economic growth that we face today, with the largest build-up of debt relative to GDP in the country's history, is at its lowest point and the polices that have been implemented to fix the problem are not only unhelpful in finding a solution but are actually magnifying the same consequences that have been associated with each past instance debt accumulation. With debt to GDP over 370% (~$70 Trillion), nominal economic growth - that is growth and inflation - of less than 3% on a long-term trending basis is a massive problem. You cannot grow out of debt when it is debt that is the problem causing the slow growth. When debt reaches the levels of today, you cannot grow out of debt, you cannot inflate your way out of debt and you certainly cannot increase debt to solve the problem. You cannot fix debt with more debt. Unfortunately, the later seems to be the path we are choosing to take and have no signs of changing course. The only solution, which I will discuss at length, is austerity. Before that discussion, let's take a look at past debt-induced panic years in the United States to spot the similarities and provide context for the magnitude of today's problem. There have been four major debt episodes since the 1800s, not including today's, that have all followed similar paths. I want to preface the discussion on the past four instances of debt accumulation and the resulting panic year by saying that each of these episodes can take on a lengthy discussion, but for the sake of this paper, I will only briefly summarize each period. Invariably there will be events that contributed to each occurrence that are not mentioned but the general theme, which is what I will cover, shows consistency across time. At the risk of being overly reductionist, I will first cover the similar phases that these manifestations of debt undergo. The process of bad debt accumulation begins with artificially created incentives. These incentives are most often created by the government, not in all cases but most commonly. The poor incentives create a desire to speculate on those manufactured incentives typically done by accumulating debt in order to fuel the speculation. The debt is used to "gamble" on these assets, most often stocks, real estate, commodities and other low cash-flow generating goods. A minority of the population sees the problems that can arise from the build of non-productive and non-cash flow producing debt in order to speculate on assets and choose to pay down their debt and exit the situation, saving themselves money and hardship in the long run in exchange for 'watching the game go on' for a period of time while others get rich, on paper, only to have it all vanish in the panic year. After a minority of the investors' exit and additional credit (debt) becomes less available to increase further speculation, the asset prices begin to flat-line, not even decline just cease their acceleration in price growth. Due to the fact that the accumulation of debt had no cash flow and the only way to pay it back was to have a rise in the asset, a halt in the rise of the price is enough to cause another wave of investors to cut their losses and sell their speculative assets. Once this occurs, the rest "smell the smoke at the same time" and all try and exit at once. This results in the panic year. This process can be simplified to an issue of artificially created incentives that drive debt-financed speculation in non-cash-flow-producing assets (Ponzi-Finance), which require higher assets prices in order to repay principal and interest; a reduction in the price of the asset that has been speculated on makes the debt unpayable since the investor is now underwater and does not have a stream of cash from the asset causing a wave of selling to cut losses and a resulting crash/panic in the asset class that was primarily speculated on. 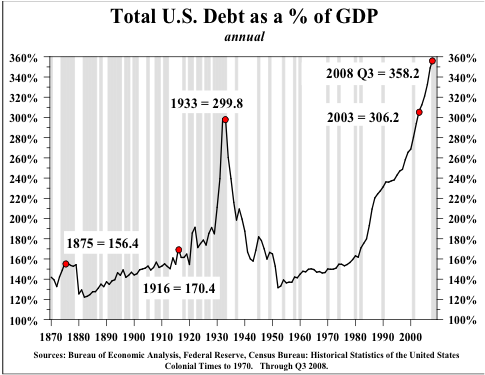 This has occurred four major times in the United States since the 1800's and is likely to happen again today due to the level of debt that has been accumulated again, for unproductive uses (stocks, real estate, bitcoin, share buybacks etc.). Again, these summaries are overly reductionist, but the trend described above can be seen clearly in each example. The first episode occurred in the 1830s in which there was a massive build-up of debt in order to build the steamships, canals and other infrastructure. While this was not the worst use of debt, the issue came from speculation in real estate along the canals as well as poorly thought out factories and other investments that did not have an immediate cash flow but rather were built as a way to "flip" for an increase in price. Investors took on debt to build homes near the major ports that caused a boom in home prices. Cotton, a non-cash-flow-producing commodity, was also speculated on using debt which caused the price to soar. The bank of England saw the easy money flowing out, their reserves declining and decided to raise interest rates, and reduce the amount of money loaned. Once the availability of credit contracted and that made its way to the United States, home prices stop rising at the same rate, factories and other projects failed, cotton prices fell and the money that was borrowed was not able to be repaid since the assets purchased did not produce the cash-flow needed to repay the money. Home values fell, a portion of the debt was defaulted on, and 1837 was the panic year. The panic of 1837 lasted until the 1860s in which another round of debt was accumulated in order to build the railroads of the United States. This was financed primarily by the government. Again, this created the incentive to speculate on real estate and other infrastructure along the rails, all fueled by an increase in household debt. Once the government sponsored railroads failed, all the assets that were driven up artificially by debt-financed speculation crashed and 1873 was the panic year. The third episode of debt-induced panic led to the great depression. In the 1920s, shortly after the creation of the Federal Reserve, easy money policy (similar to today) was enacted and this flooded the market with liquidity and caused massive speculation in stocks, real estate and commodities. The stock market reached levels it had never seen before and multiplies exploded to their highest level the markets had seen. There were also other assets that were speculated on, incentives that were created by low interest rates and easy money, including wheat, steel and cars (non-cash flow producing commodities). When interest rates began to rise, credit availability contracted and debt was unable to expand in order to continue the rise in asset prices, a minority began to sell their assets and this caused an initial decline in asset prices. By the time the rest of the population began to "smell the smoke," the panic year was upon them and the assets declined dramatically and the debt that was accumulated in order to speculate was not able to be repaid. Again, I fully understand that all of these episodes are complex matters that have much more detail, but the processes that each period went through have similarities that are consistent with debt-fueled speculation. In 1933, debt to GDP was nearly 300%. Over 100 points higher than any past crash which is why the great depression was so much more severe than the past panic years. It took over 70 years for the United States economy to reach a level of indebtedness that surpassed the 1930's. In 2008, the economy had a level of debt over 350% of GDP. Low interest rate policy as well as other government-created incentives fueled debt-financed speculation, primarily in residential real estate, a non-cash flow producing asset. When the bubble in home prices was clear, the Fed began to raise interest rates, banks contracted lending, and the rise in home prices began to accelerate as a slower pace, declining in some instances. When the rise in the price of homes ended, the debt that was taken on by households in order to speculate on the value of homes was underwater, unable to be repaid, and a crash in home prices and a panic year ensued. Another complex economic time, but it truly can be boiled down to artificially created incentives that caused a debt-fueled speculative bubble with the only path to repay debt was through a rise in price (greater fool theory) rather than through a stream of cash great enough to cover principal and interest. A contraction in the availability of debt in order to speculate stops the rise in that asset and causes the model of Ponzi-finance to collapse. For those who claim the bubble was not clear, easy to spot, or not fueled by low interest rates, I humbly submit that you simply were willingly blind. Below are three charts including home price growth in Las Vegas, Arizona, and nationally. You can see home prices growing over 50% year over year in the peak of the bubble. How this was missed is hard to imagine. Not only was the run-up clear, the decline in home prices also occurred prior to the recession as it followed the same three to four phases I outlined above. 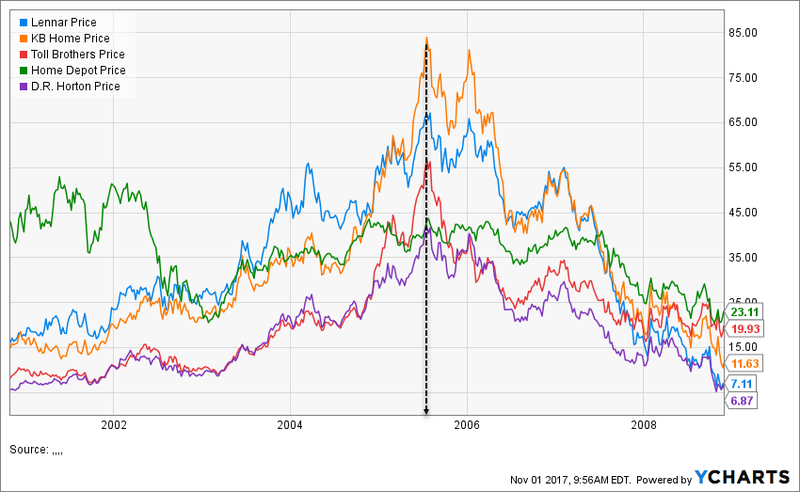 There was a commensurate rise in home-building stocks such as Lennar (LEN), KB Home (KBH), Toll Brothers (TOL), Home Depot (HD) and D. R. Horton (DHI), which peaked in 2005, not 2007, when the meteoric rise in home price growth peaked. While the stock market and the financial assets that were speculated on were saved, after they crashed when debt was unavailable, the issue was not solved. In the past three crises that I mentioned, the debt was wiped out and the economy was able to reset with a clean balance sheet. After the 1930s crash, debt to GDP fell from 300% all the way down to a healthy level of just 120%. It took over 70 years to reach the same level of indebtedness that caused the great depression, and unsurprisingly, the same level of debt caused an equal-sized crash. It took just a few years this time to surpass the level of debt that caused the 2008 crisis as we now sit with debt over 370% of GDP. It can only be assumed that since the higher the debt, the worse the crash, that the following panic year will be worse than the four preceding it. The pattern this time around is exactly similar to the past four. Government-created incentives have fueled a debt-driven speculative rise in asset prices. The assets that have been speculated on, again, are non-cash flow generative and like the past, as long as the assets being speculated on continue to rise, all is well as the debt can be repaid with higher prices. Once the prices stop rising, and there are not higher prices nor cash flow to repay the debt that was used to gamble on the assets, the panic year will ensue - and this time, with levels of debt that are higher than any panic year in history. Below are a few examples of the assets that have been driven to record highs fueled by debt-driven speculation. As history shows, once bank lending contracts and the ability to expand credit (debt) further in order to drive higher asset prices (multiple expansion, not fundamentally higher economics) the greater fool theory falls flat. Of course it is impossible to predict when this occurs, but in fact, bank lending has already begun to contract in growth quite substantially as well as the growth in the money supply which indicates that credit availability is more scarce and the bang point may be closer than most people believe. Prior to 2008, the three episodes of debt-fueled panic were followed by periods of economic prosperity for many years. The difference after 2008 was that aside from the rise in asset prices, economic growth did not rise to new highs but in fact, was slower than the last cycle. The reason we continue to have slower rates of growth is because we have not solved the problem of debt like we did in past episodes. After the 1930s there were 70 years of prosperity in which incomes rose, economic growth was robust and the standard of living rose. Austerity was the cause for a resulting period of prosperity. The debt level fell almost 200% as a percentage of GDP and the country was able to move forward with a clean balance sheet. After 2008, there was no such austerity, we chose to add more debt to solve the existing debt and the result was more of the same. Slow growth, reduction in velocity, more booms and busts in asset prices driven by easy money speculation. The best evidence today suggests that each increase in debt creates 3-5 quarters of transitory gains that give the illusion of growth. After the gains dissipate, the economy is more indebted and worse off as incomes did not rise and the standard of living did not rise but debt levels did. We continue to choose to increase the debt after each transitory spurt in growth subsides. Debt mutes the business cycle. All seems well today as the asset prices have not fallen but if/when they do, there will be no cash flow to repay the record high levels of debt that have been accumulated. When debt reaches the levels of today, you cannot grow out of debt, you cannot inflate your way out of debt and you certainly cannot increase debt to solve the problem. You cannot fix debt with more debt. Unfortunately, the latter seems to be the path we are choosing to take, with no signs of changing course. You cannot grow your way out of the problem because debt is the reason growth is so slow to begin with. Tax cuts or any other fiscal or monetary policy may induce transitory gains but the issue of debt will actually be amplified by increased budget deficits which will add to the debt, reduce velocity of money, and create slower growth and in the end, higher levels of debt that are even more difficult to repay. You cannot inflate your way out of debt because as inflation rises, which it will likely not do because debt is the reason inflation is so low (velocity is too weak), interest rates rise in proportion to the rise in inflation. Interest on the debt is already in the top three most expense categories of the budget. For those who believe that inflation is a way out, if inflation rose to 20%, interest rates would rise accordingly and the debt that rolls over will now incur an interest rate of 20% and the interest payments will take up over 100% of tax receipts and there will be no money left to repay the existing debt. The notion that you can inflate your way out of debt ignores the fact that the interest expense will rise in proportion to the rise in inflation and make the problem worse, not better. Defaulting on the debt denies futures borrowing so that option is very poor as well. Since you cannot grow your way out of a debt problem and you cannot inflate your way out of a debt problem, the only long-term solution to the debt burden is austerity, a solution that no one wants to hear. Austerity is the end game. In order to move on to a long-term period of prosperity in which incomes rise, the standard of living rises and the economy grows at a reasonable rate, you need to clean the countries balance sheet by reducing the debt burden. This is the only way to increase the velocity of money and create long-term high economic growth. To pay down the debt, you need a period of pain or austerity which most economists define as a long-term rise in the savings rate. Sometimes this period of austerity is imposed for you, other times it is the collective decision of the country but in either case, history shows there has never been a major developed economy that has solved a debt problem without a period of austerity. For example, many assume the United States got out of the great depression due to World War II. This is a superficial analysis and not completely true. The real reason the US was able repair the economy was due to austerity imposed by the government. The war had begun and our trading partners were in need of war time supplies from the United States. Our industries boomed to fill this newfound demand and this created income and a trade surplus for the country. You need to go one step further to understand how this created prosperity. While it is true the war created a boom in exports, the US government imposed mandatory rationing, which meant that households were not allowed to spend the rise in incomes they were receiving. This caused the savings rate to soar (austerity defined as a long-term rise in the savings rate) up to 25% (currently at 3% today), and this rise in the savings rate allowed the country to pay down the debt of the 1920s and 1930s. The ratio of debt to GDP did not trough until the savings rate rose in the 1940s. The imposed austerity and reduction in the debt down to 120% of GDP from 300% is what cleaned the balance sheet of the country and allowed us to prosper for almost 70 years. A reduction in debt and a clean balance sheet is what is needed again today although with debt levels way higher than the 1930s, the austerity will be even more painful which is why we seem to not have the political will to solve the problem. I want to focus on the United States economy, but in order to do that, I have to address our major trading partners, Europe, Japan and China who are more indebted than the United States and face bigger challenges than the United States. This is both a blessing and a curve for the United States for reasons I will outline. Many critics of the United States' debt burden claim that a collapse of the US dollar (UUP) is inevitable and that our debts will be repaid with worthless dollars. This is a very poor analysis of the situation as it does not take into account the global situation. The first point to make is that currencies are valued on a relative basis. The euro and the dollar cannot both go down against each other at the same time. 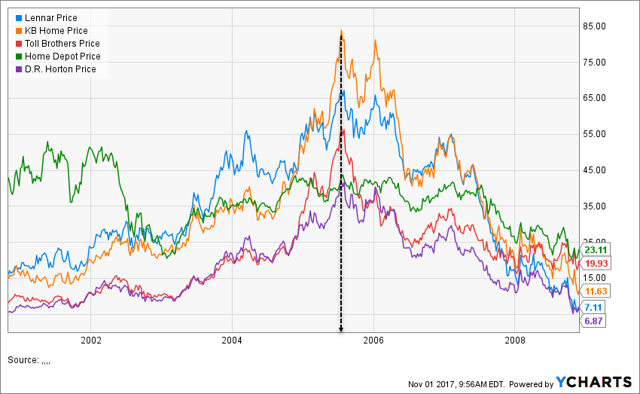 The only way that all currencies can depreciate simultaneously is if they are devalued against gold (GLD), silver (SLV) or some other commodity (USO). More on this later. Operating under the assumption that all currencies will not depreciate relative to gold for a minute, that leaves one currency to be the "winner" or the strongest relative to the others. I am referring to a long-term multi-year trends in the currencies, not monthly or yearly moves. 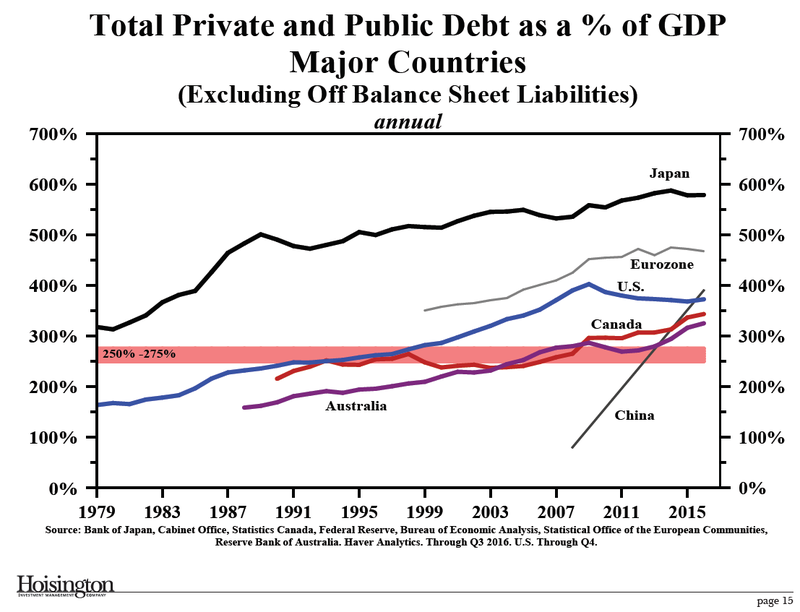 The relative indebtedness of Europe, China and Japan are significantly worse than the United States. The United States stands at debt 370% of GDP, China at nearly 400%, Europe around 475% and Japan at almost 600%. If the United States cannot repay its obligations then surely countries who are more indebted cannot repay them either and will default faster should that be the case. If the other three largest countries will by definition have to default faster than the United States, due to higher levels of debt, that serves to put a long-term bid under the US dollar. How can Japan not default prior to the United States if they have a level of debt almost two times as great. If Japan defaults prior to the dollar, then the yen (FXY) will fall dramatically and cause a massive upward pressure on the exchange rate between the dollar and the yen. Unless you believe that the US, the relatively least-indebted country, will default with less debt than other countries with more debt AND slower economic growth, then the long-run trend in the dollar must be higher. This does not refer to small moves in the dollar caused by knee-jerk reactions to Federal Reserve policy but rather large multi-year trending moves in the exchange rate of the dollar against other currencies. The long-term trend is the dollar is higher relative to other currencies. If countries that are significantly more indebted than the United States default first or continue on the path to higher levels of debt relative to the United States, there must be a long-term bid under the dollar keeping its value relative to other currencies. Higher levels of debt cause the velocity of money to decline, which is why the countries that I mentioned which have higher levels of debt also have lower levels of velocity, which causes lower long-term interest rates. The United States, having the highest relative long-term interest rates, low on a nominal level but high relatively, since currencies trade on a relative basis, will also serve as a factor keeping a long-term bid under the dollar as foreign money will demand our higher interest rates. The factors above, higher interest rates and low relative levels of debt, will serve to keep the value of the dollar relative to other currencies. This, as I mentioned, is a blessing, as the risk of default for the United States essentially cannot come prior to other countries, but also a curse as higher levels of the US dollar relative to other currencies is a deflationary pressure that serves to lower economic growth and make the debt harder to repay. I mentioned briefly the possibility of all currencies falling relative to gold or some other commodity. This is a low probability, but it is worth mentioning. I believe that the long-run trend will be upward for the US dollar for the reasons mentioned. There is the possibility that no country can repay their debts and all fiat money loses its value. In this scenario, gold will reprice to multiples of the current level (estimates are roughly $10,000 per oz) in this instance. The value of stocks, bonds, and other assets would be worthless in this case, so the discussion around inflation hurting bonds but not stocks is an irrelevant point. The only protection against this scenario is hard assets. In the portfolio I run in my Marketplace service, EPB Macro Research, I always have a certain allocation to gold as a protection against this scenario (very unlikely in the near future); the exact allocation changes based on market conditions, of course, is exclusive to my subscribers. That being said, the analysis that suggests that there is a collapse of the dollar on the horizon does not take into consideration the debt of other countries that by definition, almost have to default prior to the United States and therefore keep long-term severe upward pressure on the US dollar. A small allocation to gold protects against a total fiat currency collapse which is very unlikely, but serves as an insurance policy that is worth holding on to. I do like a small portion of gold as a long-term investment and believe it should be part of everyone's portfolio. Now that the probability of hyperinflation has been thoroughly reduced, the situation returns to the United States and to one of deflation as ever-increasing levels of debt will make our economic situation mirror that of our trading partners who are several years ahead of us in terms of debt, velocity, low growth, low inflation and low interest rates. Unless we, as a country, stop the increase in debt, which we seem to have no intention of doing, the velocity of money will continue lower towards the figures seen in Europe and Japan. Lower rates of nominal growth will be the result and similar interest rates will follow. 2.4% interest rates will be a distant memory once the velocity of money in the United States falls below 1, as will 2% economic growth. The economy is too indebted for interest rates to rise and stay up. Monetary policy has been proven to be ineffective as the last 7 years of experiments from the Fed have raised stock prices, but have resulted in the lowest level of economic growth in decades. Fiscal policy, in the form of tax cuts, will also have an immaterial effect. Many will scream to look at the Reagan tax cuts as a proxy for how the new potential tax cuts will benefit the economy, but a major hole in that logic is that Reagan had a debt to GDP ratio of around 40% at the Federal level, not 107%. Also, Reagan had the benefit of the best demographic mix the country has ever seen. Today, the demographic situation is materially worse as population growth has been declining as well as fertility rates. The problem is too large to be solved by spending alone or tax increases alone. There needs to be compromise on all sides for reasons I will outline. Currently, the Federal Budget is roughly 20% of GDP. Without any changes to policy, due to obligations that we have promised including debt repayment, social security and Medicare the unfunded liabilities are near $100 trillion and will cause the federal budget to rise to 40% of GDP in 20 years, according to the IMF. This does not take into account future borrowing that we are likely to incur so it is the most optimistic and conservative forecast. In 20 years, if the nominal rate of growth averages 2% (3% currently) that means in GDP will be roughly $30 trillion. If the budget increases from 22% to 40% of GDP, that is an 18% transfer from working households to retired households that we have promised. 18% of a $30 trillion economy is a $5.4 trillion per year increase in spending that needs to come out of the economy. Again, that is per year. The only way to find an additional $5.4 trillion per year, is to borrow it, further adding to the debt problem and raising the interest payment expense or to tax it. That is on top of the current taxes. Taxes collected are only about $3.5 trillion today. This implies that over the next 20 years, without any additional debt (nearly impossible) that the taxes need to rise to $9 trillion in order just to keep the level of debt to GDP ratio the same at 370%, not to mention trying to reduce it. Increasing the level of taxes over 100% is essentially impossible and would certainly grind the economy to a halt. The only solution has to come from a combination of spending cuts, tax increases and a long-term rise in the savings rate. The issue is that the best analysis suggests that a $1 increase in the marginal tax rate reduces economic growth by $2-3, a negative multiplier. Reducing loopholes, of which there are currently over 3,000, does not have the same negative multiplier and is more effective. Therefore, a reduction in spending, an increase in taxes by reducing loopholes but NOT by raising the marginal rate (in fact you can cut the marginal rate to spur growth if the loopholes are closed and the tax base rises), and a long-term rise in the savings rate are the only hope to get the economy back on track. On top of this, there would likely need to be a consumption tax. Ironically, a consumption tax and no income tax is the best way to run a prosperous economy but the days of that being the only solution are long gone; the problem is too great. Thomas Hobbes said "income is what you give to society, consumption is what you take from society." By taxing income, we are punishing contributions and encouraging consumption (lack of savings). A consumption tax leads to high rates of saving, a vital component to a long-term healthy economy. There needs to be structural reform to social security and Medicare because even with the above prescription, which would be enormously painful in the short run, it is not enough to meet the obligations and debts that we have assumed. If we do follow the above plan, short-term pain for long-term gain, we are looking at a multi-year decline in GDP. We do not seem to have the political will to go down that path and we instead are choosing a path of increased debt on top of old debt. By following the same path, we are going to get the same result. Students of history will understand that we have been down this road four times before and will make investments accordingly. 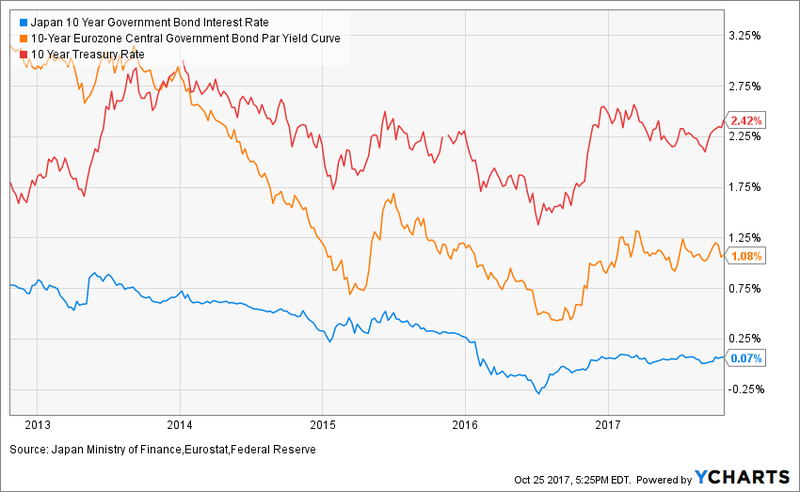 Long-term interest rates will fall due to increased debt, reduced velocity and lower growth/inflation will make long-term bonds (TLT) (IEF) a strong long-term investment for the capital appreciation that will come when interest rates fall to the level of Europe and Japan over the next 10 years. Of course this should be hedged with gold for the reasons outlined in the above sections. The gain on a long-term bond from 2.5% down 1% or lower is enormous. Anyone who bought a Japanese JGB at 2% is in good shape with rates now at 0%. They are getting 2%, and have a massive appreciation on the bond. Since we know the path that Europe and Japan took, and we have no political will to follow the above prescription but rather are following in their footsteps, we will get the same result. The path to lower nominal growth and therefore lower interest rates is set in stone due to the increases in debt. If we continue on the path towards the indebtedness of Europe and Japan, our economy will mirror those results. Velocity will crash which will make any fiscal or monetary policy ineffective because the increase in money supply will not circulate fast enough to spur the required growth. 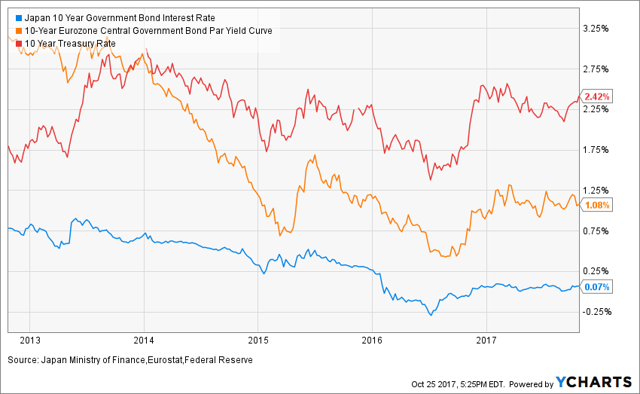 The lows in long-term interest rates are nowhere near the current levels. If we continue on the path of Japan we could see 10-year yields at the same level, sub 1%. That is likely more than 10 years away, so the current forecast, outlined in the introduction, is that the Federal Reserve is going to reverse the course of monetary policy before the end of 2018 due to severe disinflation and anemic or even recessionary levels of growth brought on by excessive debt, and that the equity market (DIA) will experience a much choppier ride due to these factors. The Federal Reserve is likely to cut interest rates by the end of 2018 due to falling long-term rates that will cause a very flat or inverted yield curve (BND), hurting the banking sector - JPMorgan (JPM), Bank of America (BAC), Goldman Sachs (GS) - and changing investor sentiment to one of more caution and fear of a pending economic slowdown. The result of Federal Reserve policy that created a horrible incentive of too much debt will be one of deflation, not inflation, and create lower growth, lower interest rates and a structurally weaker economy unless we are willing to address the problem. Another panic year will occur and we then have the choice to go in the opposite direction of our trading partners and get a different result or take the same path of more debt and achieve the same result. Until then, long-term bonds, hedged with a small amount of gold is, in my opinion, the best long-term investment out there today. If rates go the way of Japan over the next 10 years, that will be a tremendously profitable investment. Republicans control both houses of Congress and the presidency, which conservatives of yore would anticipate would result in a sustained assault on the most important national security challenge facing the United States. That yawning vulnerability in our defenses is the national debt. But the tax plan released Thursday by the congressional leadership would have Dwight D. Eisenhower weeping. Not only will it increase the debt, but it also has no reasonable prospect of providing the money the administration argues the defense enterprise requires. The U.S. government now owes roughly $20.5 trillion, more than double what our debt was 10 years ago. President Donald Trump and the Republican-led Congress have introduced a tax reform bill that would decrease federal revenue by a projected $5.5 trillion. Meanwhile, Republicans in Congress are congratulating themselves on committing to increase the debt by only $1.5 trillion over 10 years and are currently wrangling over possibilities — capping 401(k) deductions, taxing college endowments — to close the gap. Even if they succeed in finding a formula that can attract sufficient votes to pass into law, the tax reform is likely to worsen rather than improve on our security. The debt is important in three ways. First, in relation to GDP, it is an important indicator of the country’s risk of stagnation that prevents growing the economy — even middle school students know that increasing the denominator makes the numerator relatively less important. Second, it exposes us to risk in credit markets: Should holders of U.S. debt become skeptical of our creditworthiness, interest rates will increase, making our debt costlier and putting further pressure on the government’s ability to provide services, including defense. Third, debt service is impinging on the funds available for discretionary spending, including defense spending, and that is likely to get much worse if either interest rates rise or the economy sputters. The United States has been extraordinarily lucky that we have accrued such staggering debt in a time of historically low interest rates. We have also been lucky that other prospective holding currencies have not become genuinely substitutable: The euro has its troubles with shaky eurozone finances, the renminbi its opaque stewardship, and cryptocurrencies their cybervulnerabilities. But none of these conditions is likely to remain fixed over time, especially if the political dysfunctionality of spending by the U.S. government continues. The Budget Control Act will remain the law of the fiscal land, the Damoclean sword of sequestration hanging over the Defense Department’s head. A decade ago, Congress reached a bipartisan agreement that cuts to federal spending would be applied with 50 percent to domestic priorities and 50 percent to defense. It has become the closest thing to an immutable law of federal spending. Secretary of Defense James Mattis has argued that the Pentagon deserves a disproportionate amount of federal spending. But his appeals have not changed a single vote. Defense Department spending has been declining for more than a decade, due first to President Barack Obama’s policy choices and then the mandatory cuts required when the Budget Control Act spending ceilings were breached — which they have been for the past nine years. Congress could not reach agreement on prioritized reductions and so agreed to limit federal spending by cutting everything proportional to existing budgets. Which is, needless to say, terrible management. In 2012, a subsequent chairman assessed that the defense strategy could not be carried out if “even $1” were cut from the Pentagon budget. And yet $50 million was cut from that budget, even before the Budget Control Act kicked in. In the six years since the act became law, the military chiefs and their civilian superiors have uniformly and repeatedly argued that resources are inadequate to their assigned missions and that Congress tying their hands against sensible management of their budget compounds the problem. The Office of Management and Budget must privately believe that it is giving fiscal conservatives in Congress political cover to vote for deficit spending. That is, in order to get needed defense spending, Republicans will vote for domestic spending and increasing the debt. Republican leaders must be banking on tax reform spurring economic growth sufficient to dull the edge of fiscal husbandry and making painful trade-offs unnecessary. This is wildly unlikely unless Republican leaders — in the White House and in Congress — do the hard work of persuading their colleagues on both sides of the aisle to adopt a set of national priorities. Nothing in the behavior of President Trump, his budget team, or Republican leaders in Congress indicates that will be the case. And if it is not, the Republican tax reform proposal, even if it passes, will leave our greatest national security vulnerability exposed and continue the emaciation of our defense program. Kori Schake is a fellow at the Hoover Institution. TOKYO – In 2008, when the United States’ National Intelligence Council (NIC) published its volume Global Trends 2025, a key prediction was tighter energy competition. Chinese demand was growing, and non-OPEC sources like the North Sea were being depleted. After two decades of low and relatively stable prices, oil prices had soared to more than $100 per barrel in 2006. The shale boom has propelled the US from being an energy importer to an energy exporter. The US Energy Department estimates that the country has 25 trillion cubic meters of technically recoverable shale gas, which, when combined with other oil and gas resources, could last for two centuries. The International Energy Agency now expects North America to be self-sufficient in energy in the 2020s. World markets have also been transformed. Previously, gas markets were geographically restricted by dependence on pipelines. That gave market power to Russia, which used it to exercise political and economic leverage over its European neighbors. LNG has now added a degree of flexibility to gas markets and reduced Russian leverage. In 2005, only 15 countries imported LNG; today, that number has tripled. Moreover, the smaller scale of shale wells makes them much more responsive to fluctuations in market prices. 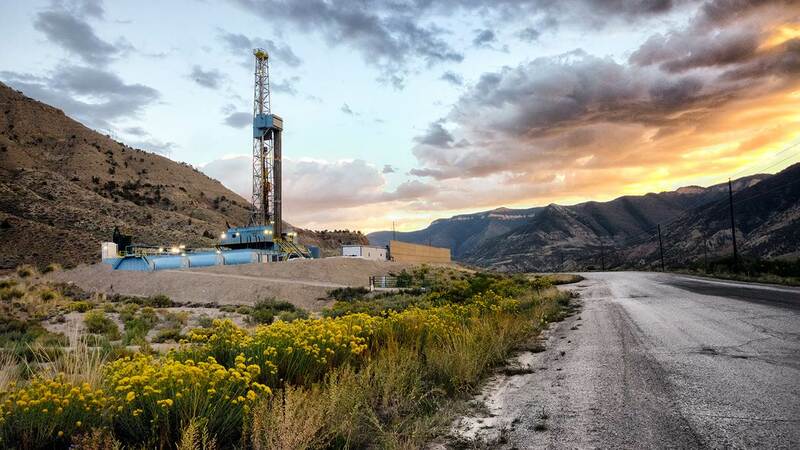 It is difficult to turn on and off the billion-dollar multiyear investments in traditional oil and gas fields; but shale wells are smaller, cheaper, and easier to start and stop as prices change. This means that the US has become the so-called swing producer capable of balancing supply and demand in global hydrocarbon markets. As Harvard’s Meghan O’Sullivan points out in her smart new book Windfall, the shale revolution has a number of implications for US foreign policy. She argues that the new energy abundance increases US power. Shale-energy production boosts the economy and creates more jobs. Reducing imports helps the balance of payments. New tax revenues ease government budgets. Cheaper power strengthens international competitiveness, particularly for energy-intensive industries like petrochemicals, aluminum, steel, and others. There are also domestic political effects. One is psychological. For some time, many people in the US and abroad have bought into the myth of American decline. Increasing dependence on energy imports was often cited as evidence. The shale revolution has changed that, demonstrating the combination of entrepreneurship, property rights, and capital markets that constitute the country’s underlying strength. In that sense, the shale revolution has also enhanced American soft power. Skeptics have argued that lower dependence on energy imports will cause the US to disengage from the Middle East. But this misreads the economics of energy. A major disruption such as a war or terrorist attack that stopped the flow of oil and gas through the Strait of Hormuz would drive prices to very high levels in America and among our allies in Europe and Japan. Besides, the US has many interests other than oil in the region, including nonproliferation of nuclear weapons, protection of Israel, human rights, and counterterrorism. The US may be cautious about overextending itself in the Middle East, but that reflects its experience with the costly invasion of Iraq and the general turmoil of the Arab Spring revolutions, rather than illusions that shale produces political “energy independence.” America’s ability to use oil sanctions to force Iran to negotiate an end to its nuclear-weapons program depended not only on Saudi willingness to make up Iran’s exports of a million barrels per day, but also on the general expectations that the shale revolution created. Other benefits of shale energy for US foreign policy include the diminishing ability of countries like Venezuela to use oil to purchase votes at the United Nations and in regional organizations of small Caribbean states, and Russia’s reduced ability to coerce its neighbors by threatening to cut off gas supplies. In short, there has been a tectonic shift in the geopolitics of energy.